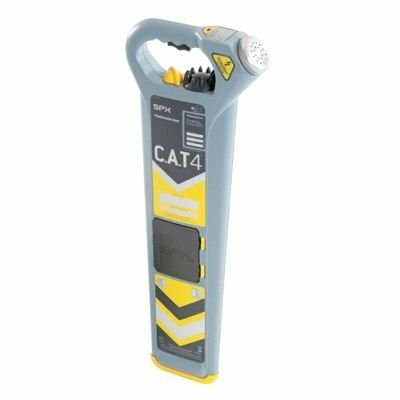 The C.A.T4™ and Genny4™ range represents the latest evolution of the highly popular Cable Avoidance Tools, as pioneered by Radiodetection, enabling operators to work more efficiently, more safely and to manage their C.A.T4 and Genny4 fleet more effectively. The new C.A.T4 digital platform delivers highly refined locate capabilities, specifically designed to help the operator find more buried utilities. The C.A.T4 Avoidance Mode™ lets the operator check an intended excavation area for Power, Radio and Genny signals, and pinpoint located utilities in a single scan. 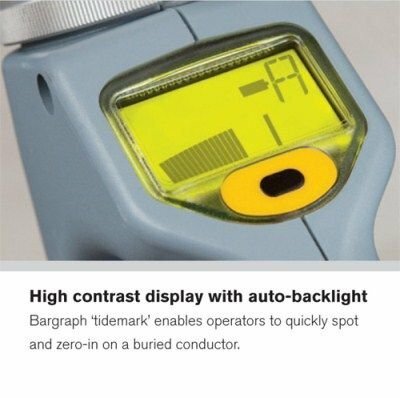 Features such as the bargraph ‘tidemark’ enable an operator to quickly spot a peak response and zero-in on a buried conductor. The new Genny4, with a new integrated logic design, provides a class-first simultaneous dual-frequency signal output design. Alongside the familiar 33kHz locate signal for general purpose locates, the Genny4 transmits a second frequency designed to facilitate location of small diameter cables such as telecoms and street lighting, including spurs. For tricky locates, the new power boost function enables the locate signal to travel further and deeper, and couple onto utilities more easily. Radiodetection’s proprietary StrikeAlert™has been improved to reduce the number of shallow cable strikes. The C.A.T4 guides users towards better and safer working practices through its optional SWING™ Rate detector and Service Due date warning. Optional data acquisition capabilities allow Plant Supervisors to administer their fleet more safely and effectively by providing comprehensive logs of C.A.T4 usage for analysis and personnel development. C.A.T4 is a safety-critical precision instrument and the optional 30-day countdown to the Service Due date, CALSafe™ and innovative eCert™ on-line system calibration validation capabilities are designed to reinforce company and recommended service policies. Minimise the risk of hitting a shallow cable with the optional StrikeAlert™ which has been enhanced and optimised to reduce the instances of false warnings. 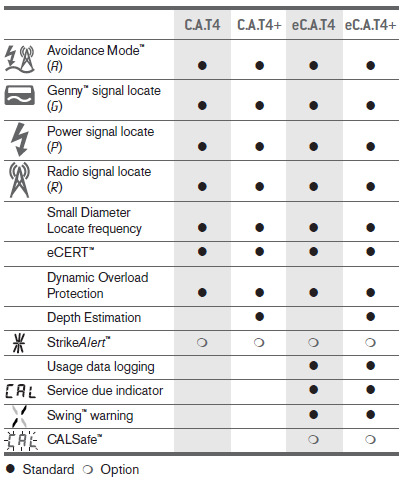 eC.A.T4™ series products can store over a year’s worth of the key measurements and modes of operation. C.A.T Manager™ can be used to export log files to enable detailed data usage analysis offering multiple benefits such as identifying training and development needs, and providing independent historical records of the instrument’s use. Backed-up data on a PC gives virtually unlimited record keeping for the life of the product. Radiodetection’s unique digital signal processing capabilities equips the C.A.T4 with the ability to reject electrical interference. Dynamic Overload Protection gives C.A.T4 series products the ability to continue operating in electrically challenging areas, such as near substations and under power cables, where other locators’ detection circuitry may be overloaded and no longer function. Sweep an area of Power, Radio and Genny signals simultaneously, saving time. C.A.T4 lets operators control the sensitivity of each mode/signal, enabling buried utilities to be pinpointed in a single pass, while Real Sound provides audio feedback derived directly from the utility located, easing identification to maximise speed whilst maintaining safety. eCert provides a fast and thorough test of key circuitry elements within C.A.T4, and validates their performance against the original factory calibration over the internet. eCert™, activated through the C.A.T Manager software, provides a fast, thorough and convenient test of the key locating circuitry within C.A.T4, and validates its performance against the original factory calibration. Following an eCert test pass, a Radiodetection Calibration Certificate for that C.A.T4 can be printed or saved. What's more, C.A.T Manager can reproduce the original factory calibration certificate, or any eCert certificates that it has produced, on demand. For a complete maintenance package, Radiodetection also offers exhaustive factory-backed service and recalibration options including full mechanical integrity inspection and function testing. Radiodetection C.A.Ts are designed to respond exceptionally fast to even the smallest detectable underground signals. 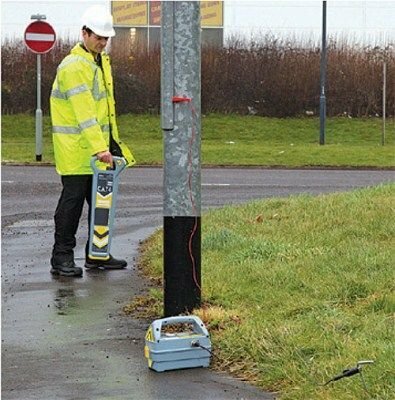 Radiodetection's research into underground signal detection has shown that the ability of an operator to identify these buried utilities is directly affected by careless working practices such as excessive or rapid swinging. To further reduce utility strike risks, eC.A.T4 units are equipped with sensors to detect such incorrect usage and warn the operator with an alert that is also stored in the data log. Minimise the risk of having to delay a survey because a C.A.T4’s calibration has expired. eC.A.T4 series products provide a 30 days countdown warning to the expiry of the calibration certificate. The optional CALSafe can be set to prevent the unit from operating outside the calibration period, ensuring compliance with company policies – and the interval required between services can be customised within a 1 year period using the C.A.T Manager software. The C.A.T4’s high visibility display helps to minimise the possibility of misreading critical information from the unit. The high contrast and automatic backlight illumination provide optimum visibility in all light conditions. C.A.T4 locators are supported with the dedicated C.A.T Manager software package. This Windows®PC program allows plant, fleet and site managers to minimise down time by performing software upgrades, sending a service request or reproducing calibration certificates. To match individual preferences or intended use, C.A.T Manager can disable or enable C.A.T4 features such as depth estimation and warnings. User-editable fields enable plant/fleet codes and other details to be stored on the unit, simplifying records and traceability. The Genny4 offers, alongside its standard power mode, a Signal Boost feature which increases the output signal by up to 10 times allowing you to locate over extra distance and depth. Additionally, the simultaneous Small Diameter Locate frequency design aids detection of smaller cables including spurs. The Radiodetection eCAT4 range of cable avoidance tools combines all the ground breaking safety features of the Radiodetection CAT4 models with an array of advanced on-board data acquisitioning tools. Developed as part of the Radiodetection CAT4 design, the eCAT4 incorporates the enhanced Avoidance Mode allows the operator to check an intended excavation area for Power, Radio and Genny signals simultaneously, pinpointing buried utilities in a single scan. The additional 131kHz frequency provides a strong trace signal and a longer range when inducted by the Genny4. Whilst the StrikeAlert option minimise the risk of hitting a shallow cables. SWING Warning A new improvement incorporated into the Radiodetection eCAT4, is the introduction of a swing warning device which warns the operator if the cable avoidance tool is not correctly point to the ground through excessive or rapid swinging. To further reduce utility strike risks, eCAT4 units are equipped with sensors to detect such incorrect usage and warn the operator with an alert that is also stored in the data log. Data Acquisition The Radiodetection eCAT4 range is equipment with onboard memory to store over a year’s worth of the key measurements and modes of operation. When hooked up to a computer running the CAT Manager, fleet managers can access the data and export the instruments log files. Multiple benefits are provided through identifying training and development needs, whilst independent historical records of the instrument’s usage can be maintained. Service Due Indicator Annual service and calibration is essential to ensuring that a CAT is functioning correctly whilst providing the confidence that it can locate within the manufacture’s intended parameters. To support this, the Radiodetection eCAT4 provides a 31-day Service due countdown warning on start-up. CALSafe Radiodetection eCAT4 CALSafe feature can be set to automatically deactivate the unit on expiry of the defined calibration interval.